What people wear provides the most basic description of a people. How it is worn often demonstrates the identity of the people, environment and culture; the final product – the traditional attire. “Traditional costumes” are reflective of one’s identity and mirrors the tribe’s rich historic past – as that of the Yakans. The Yakans are native inhabitants of Basilan, Philippines. Their home is in Lamitan. They are basically upland rice farmers and known to be the finest weavers in Southern Philippines. This is evident in their intricately woven tight-fitting costumes, emanating their love for art and nature. Their traditional attire and woven textiles are their most prominent visual means of expression. In the bid to outshine others, they have also produced the most colorful and eye-catching attire. Since Yakans populate mostly the interior of the island province, they made costumes that fit their arms and legs to keep them warm at night or during a storm. In the past, the Yakans used silk threads, homespun cotton threads and pineapple fibers to produce textiles depicting the designs they see in their surroundings. Most of the designs on their weave and costumes are inspired by geometric figures and from nature. In Yakan society, the traditional costume is integral in defining their identity and social class. 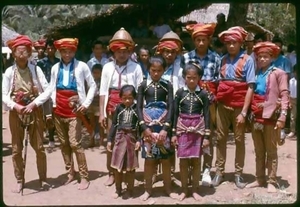 The Yakan attire basically consists of “badju (top)” and “sawal (trousers).” These blouses and trousers are tight at the sleeves and leggings. These may be worn by both men and women but with restrictions as to why and how one should wear a particular clothing. The “sawal” is the general term referring to any traditional Yakan trousers. This has tight-fitting legs from knee-down and the section from the thigh going up hanging loose; with a band of cloth sewn at the waist which firmly holds the pants in place when folded. It has a knee-joinery line called “ bakiyaq,” an embroidery of tiny chain stitches of four to six color bands. A “sapid,” plait or braid, made of intertwined threads is stitched at the section where the woven cloth is sewn together and around the part of the leggings that reaches the ankle. The woven cloth used for the trousers is called “sinelu’an.” This is the most intricate among all the woven designs of the Yakans. It has tiny diamond designs arranged in columns between stripes resembling the sections of the bamboo. The “sawal” is classified according to the materials and the wearer’s status in society. “Sawal peyat,” “sawal bunga-sama teed,” sawal binuldahan” are for the rich and the upper class. The “badju” is a tight-fitting top made of woven material or purchased black material “naynay.” It has tight-fitting sleeves and decorated with gold buttons called “batawi.” The bigger in size and the number of buttons decorating the “badju” dictate who the wearer is of these traditional Filipino clothes. “Badju” for men are usually open at the front with a pair of “jambu” (tassels of silk threads)” sewn at the collar. Yakan women also weave other articles that form part of the entire costume. For the men, they have the “pis,” a head cloth measuring one meter or more on each side, forming a square, commonly with red background symbolizing a Yakan man’s bravery and strength coupled with green, yellow, and black plaits. They also wear the “kandit,” traditional belt for men reaching fifteen meters or longer and made of red cotton cloth called “gilim.” This is tediously coiled around the waist with tassels of unwoven sine’luan cloth sewn at one end to cover the genital area. The belt is worn for protection during combat and at times used as hammock for resting or a pillow at night. The women wear a tubular skirt called “olos.” This is woven using silk threads intertwined with a cotton background and wrapped around their waist to cover that area. Over the “olos,” the women wear the “seputangan.” It is a square meter woven cloth of geometric designs and the most expensive part of the female costume due to the intricacy of its design. This is folded and tied over the “olos” to tighten the hold of the pants on the waist. This may also be worn as a head covering, or donned on the shoulders of brides and grooms on weddings. To complement the costume, the Yakans wear the following: the “sappa” or “lutuan” (betel nut container tied around the waist), barung dende (female bolo with the scabbard inlaid with mother of pearl and silver coins) barung lella (male bolo with the scabbard wound with nito vine), saruk (nito hat), dublun (coin brooches) “gallang (bracelets), “pammang (earrings)” and “sugley (comb of gold and bedecked with stones)” for the women.